This is the first complete recorded collection of Carl Vine's piano music, and includes the world premiere recording of The Anne Landa Preludes (2006). 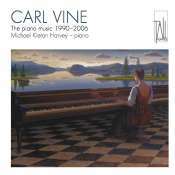 Prodigiously gifted Australian pianist, Michael Kieran Harvey, has a long association with Vine, having premiered both of his sonatas as well as the Piano Concerto (1997). As well as featuring the premiere recording of the Preludes this disc includes brand new recordings of Vine's Five Bagatelles, Red Blues and his signature keyboard work, the First Piano Sonata. The recording of the Second Piano Sonata is reproduced here from Harvey's earlier Tall Poppies release, Chamber Music Volume 2 (catalog number TP120). Among the piano music of the past quarter-century, Carl Vine's holds a considerable place through its scintillating technique and far from facile immediacy. Both of his sonatas adopt the two-movement format favoured in the Baroque and early Classical eras, but their expressive ambit is distinctly that of the late 20th century. The First (1990) draws on Carter's imposing model in its emphasis on contrasts of motion and texture to create a powerfully cumulative whole, with the Second (1998) focusing instead on more fully defined themes whose eventful transformation brings about the overall form. Both of these works are superbly realised by Michael Kieran Harvey, who championed the First and commissioned the Second, and who is equally authoritative in the smaller pieces. Five Bagatelles (1995) explore modest but characterful qualities - culminating in a finely sustained "Threnody" - as does the even briefer Red Blues (1999), albeit from the perspective of young students (which does not make them easy). Expressively more diverse, The Anne Landa Preludes (2006) are deftly achieved evocations whose individual titles offer possible points of reference, moving intently towards a "Chorale" whose profundity is achieved without overt religious connotations. Clearly Vine is as able looking inwardly as he is projecting dynamic exuberance. A pity that the excellence of the recorded sound in these works is not shared by the sonatas, with their tendency to coarsen at climaxes, but this is a small blemish on an otherwise excellent release - which, with informative notes by composer and pianist, is strongly recommended. The works on this CD present all the piano music written by the Australian composer Carl Vine (b. 1954) from 1990 (the First Piano Sonata) until some point last year (the recordings date from three occasions between February 1999 and May 2006). If you're familiar with Vine's orchestral music you won't be surprised to find that his piano music comes with a similar charge of high-voltage rhythmic energy. The two-movement Piano Sonata No 1, explicitly modelled on Elliott Carter's Piano Sonata of 1946, starts deceptively, though: sleepy, bluesy chords suggest langorous summer heat, but the piece soon erupts into a headlong toccata, sounding something like Minimalist Prokofiev before it subsides back into its uneasy calm. The second movement is a breathless moto perpetuo built on motorically repeated phrases, dying into a chorale section that seems to hint at sunken cathedrals under a rather Celtic decorated melody in the treble; the mad race then resumes. 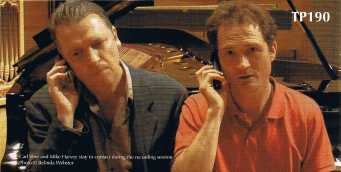 The First Sonata (recorded on a Steinway D in 2004) acts as exemplar for much else that's on the disc. The 1998 Second Sonata (captured on a Stuart & Sons instrument in 1999), again in two movements, offers the same mix of wildly exciting motoric rhythm offset by passages of angular melody and chordal calm. The other three works here are built from series of miniatures: the Five Bagatelles date from 1994, Red Blues (four pieces for young performers) from 1999 and The Anne Landa Preludes - 12 of them, exactly 24 minutes in length - from 2006. They show in microcosm the same kinds of contrasts as you find in the sonatas: toccatas, blues, laments, manic boogie-woogies. The whimsy in Vine's programme note on The Anne Landa Preludes - commissioned in memory of a Sydney supporter of the arts - is reflected in the grim humour that pervades much of the music. Michael Kieran Harvey plays like a man possessed: he flies at Vine's breakneck explosions of energy like a pitbull at a postman, maintaining absolute textural clarity whatever the tempo. The recordings are commendably clear but have minor shortcomings: the First Sonata and miniatures have too much halo, and the Second is too distant.